The UbiWorkshop Twitter account sprung to life today, delivering this teasing glimpse of an Egyptian assassin from Polish artist Gabz, along with news of a secret project from acclaimed comic book artists Cameron Stewart and Karl Kerschl. "Oh, and before you ask, this has nothing to do with Assassin's Creed Brotherhood," Tweets UbiWorkshop, in response to the Gabz illustration that appears when you visit the UbiWorkshop.com website. The teasing image was delivered following a brief exchange between UbiWorkshop and comic book artists Cameron Stewart and Karl Kerschl, going back and forth about another top secret project the pair is working on. The Gabz image Tweet was prefaced with "Until we can tell you more about the secret project @CameronMstewart and @karlkerschl are working on..."
With three talented artists spanning two secret projects, we're thinking that Ubisoft might be furthering their transmedia agenda with a strong comic book push. 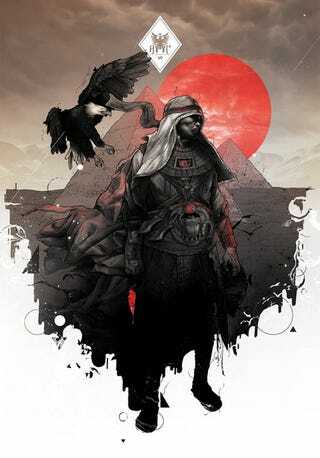 The striking illustration by Gabz has me hoping for some sort of 'assassins through the ages' art book. Until these new secret projects become less secret, I'd suggest keeping your eyes on the UbiWorkshop web page for new developments.